Republicans Debate the Issues | Kid Reporters' Notebook | Scholastic Inc.
Who will be the Republican nominee? Left to right: New Jersey Governor Chris Christie, Florida Senator Marco Rubio, neurosurgeon Ben Carson, Wisconsin Governor Scott Walker, businessman Donald Trump, former Florida Governor Jeb Bush, former Arkansas Governor Mike Huckabee, Texas Senator Ted Cruz, Kentucky Senator Rand Paul, and Ohio Governor John Kasich. On August 6, the first big Republican debate of the 2016 presidential campaign took place in Cleveland, Ohio. Supporters of the candidates, as well as members of the media, filled the Quicken Loans Arena. “I think it’s interesting to see who’s going to pop out of this in some way, whether it’s good or bad,” TV reporter Stacey Frey told me as the arena buzzed with excitement. Two debates were held in order to accommodate the field of 17 candidates. 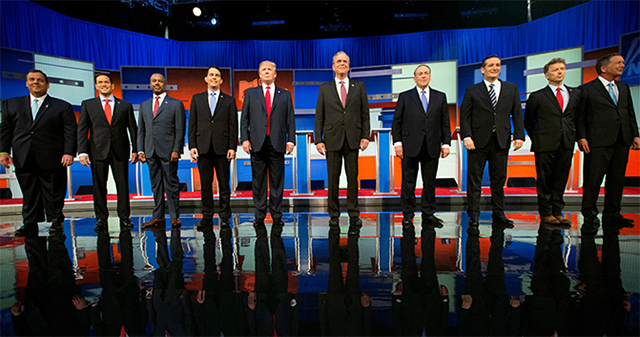 But it was the second debate, which featured the top-10 hopefuls, that drew the most attention. A record 24 million viewers tuned in. Many wanted to see front runner Donald Trump, a successful real estate executive who is best known as the host of The Apprentice, a popular reality TV show. During the debate, Trump faced off against former Florida Governor Jeb Bush, Wisconsin Governor Scott Walker, former Arkansas Governor Mike Huckabee, retired neurosurgeon Ben Carson, Texas Senator Ted Cruz, Florida Senator Marco Rubio, Kentucky Senator Rand Paul, New Jersey Governor Chris Christie, and Ohio Governor John Kasich. When I asked Ben Carson about the challenges facing our generation, he cited the national debt, which is now more than $18 trillion. The next Republican debate is slated for September 16. Democratic candidates will face off on October 13. For now, all of the candidates have one thought in mind: winning the White House in 2016.